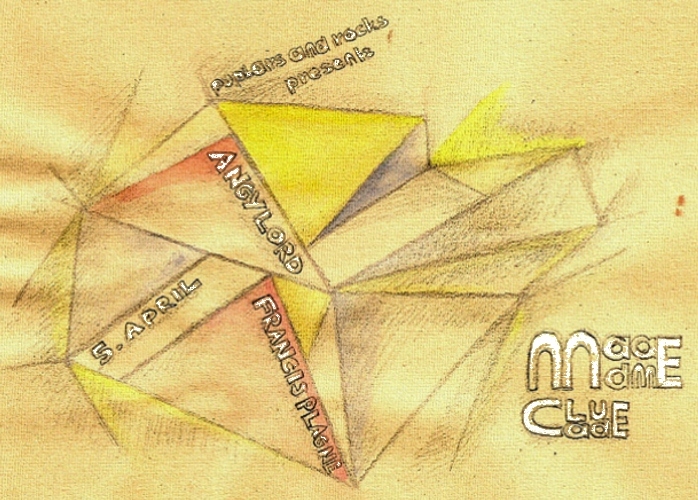 This april at madame claude: Angy Lord and Francis Plagne. Angy Lord normally plays drums in the very charismatic sister-duo Jollygoods. but she also understands well to play some softer chords, proven here with her solo-project where she hits the piano and organ keys. lyrically dark, catchy monotonous songs carry a fragile, sometimes angry voice. Francis Plagne is a Melbourne based musician currently on a stop in europe. His music oscillates between popular tunes and highly experimental sounds. his third and last long player so far, Tenth Volume of Maps, was out 2011 on Lost and Lonesome. On the recording he collaborated with different musicians, one of them being Ned Collette, who will also join live on stage at madame claude. Madame Claude, april 5th, 9pm. admission free donation. on decks rad spin rotate club. facebook event there.